Glasgow style Art Nouveau. 8-storey commercial building with shop at ground floor. 3 irregular bays to Hope Street with canted corner; 3 shallow canted return to Bath Lane. Reinforced concrete. Casement windows with small-pane glazing. 1st floor cill band. Sculpted panel between 1st and 2nd floor. Eaves cornice. Square canted section in southmost bay rising from 1st to 4th floor corbelled out on sculpted heads at 4th floor; wide semi-circular keyblocked window in panelled section in 6th surmounted by pedimented gable. Canted corner bay slightly advanced over 4th floor and surmounted on 7th floor by octagonal cupola with parabolic arched windows, bracketted cornices, small dormers, narrow central bay: circular window to 4th floor, small windows above, round-headed at 6th floor.Projecting southern return with simple fenestration surmounted by pedimented gable. Double stack rising from south-west angle. Return to Bath Lane: 3 shallow, canted return bays with metal casements. April 1991: The building is affected by water-pooling, cracking and spalling. The co-owners discuss options for the building and decide to pursue demolition due to structural decay. Repairs are estimated at £1-1.5 million. SCT recommends retention and the seeking of grant aid. 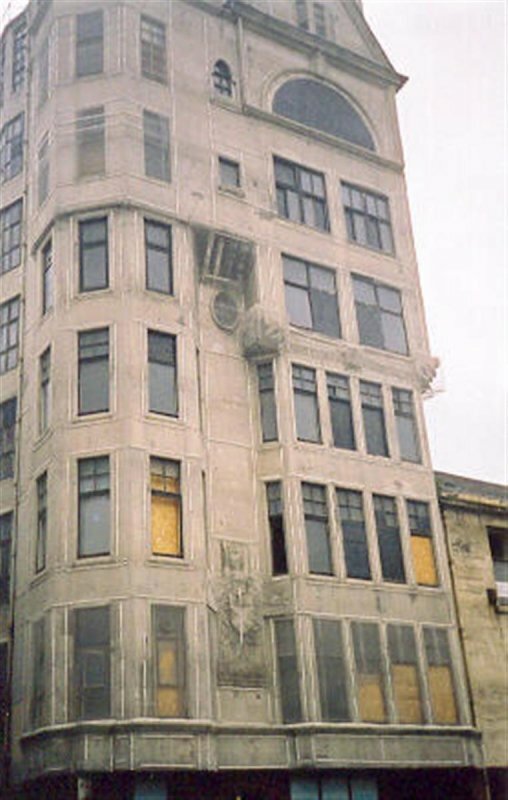 3 March 1995: The Scotsman reports that all occupants of the building have been evacuated following fears of collapse. It is owned by 9 bodies and is fully occupied, currently housing the Italian Consulate. Masonry has fallen from the building onto the pavement below. Building Control is now to assess the building. The factors hope to undertake remedial repairs, but full term repair will depend on securing grant aid. 12 April 1995: The Independent reports that the owners have been served with a Dangerous Building Notice. They have submitted a demolition application. 22 May 1995: The Herald reports that remedial repairs are estimated at £1.5 million, though this will only prolong the life of the building by 20 years. 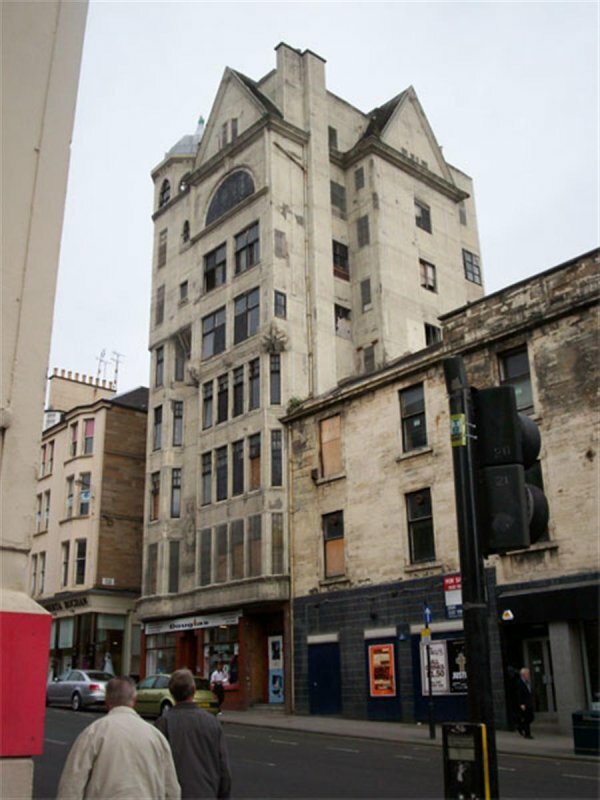 A report on the building has now been submitted to Glasgow City Council by Glasgow Building Preservation Trust. It advocates a more long term but expensive approach to repairs, though this approach is more likely to secure grant aid. 29 August 1995: Press reports note that permission to demolish has been refused. The owners have been given a further 6 months to comply with the Dangerous Building Notice. 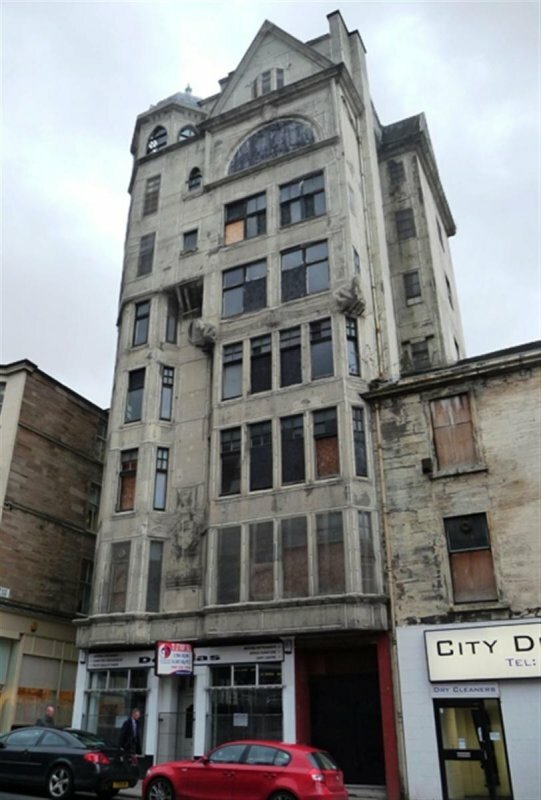 They are keen to hear of other parties wishing to take on the building, and have been in discussions with the Glasgow Building Preservation Trust about undertaking repairs. 4 October 1996: The Scotsman reports on the building. 1999: The Annual Report of the Architectural Heritage Fund reports that £5,000 has been granted for a feasibility study. The study concluded that re-use as dwellings and workshop space was viable. Historic Scotland and Glasgow City Council have agreed that more research is required into the building's mode of construction, though funding applications will be submitted in tandem. October 1997: GBPT reports that the available floorspace will not offset the capital costs of restoration, so Lottery funding remains pivotal to the project. GBPT wishes to develop a centre for young designers, including workshop and training spaces, to be called the Centre for Product Resource Innovation and Design Enterprise (PRIDE). Residential and commercial uses remain an option. 26 October 2001: The Scotsman reports that Glasgow City Council has approved £156,000 to replace scaffolding with wire mesh, buying a further 2 years in which to create a funding package. The Council will now purchase the remaining offices from the owners. 2001: The Annual Report of the Historic Buildings Council for Scotland reports that £22,958 has been awarded to help with scaffolding costs. 2002: The Annual Report of GBPT reports that the proposal to erect wire mesh remains active and would result in the Dangerous Building Notice being lifted. 2 buses have collided with the scaffolding, which subsequently required re-erection. 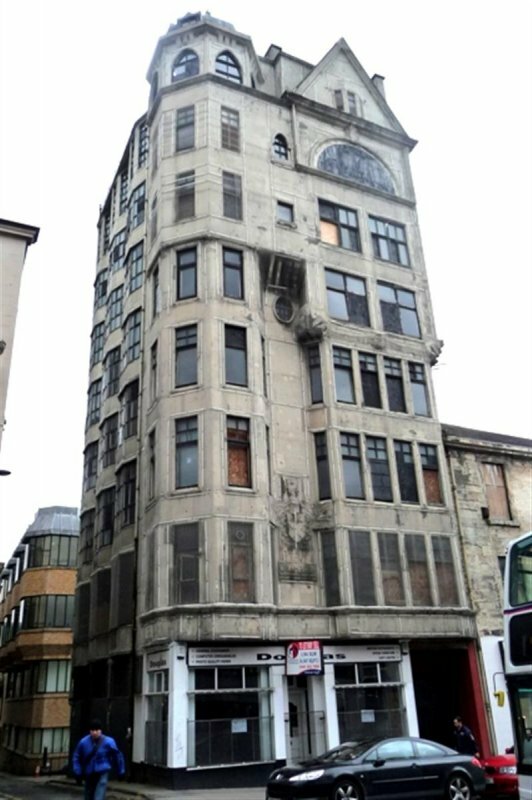 Glasgow City Council is in discussions with a number of developers regarding the building. 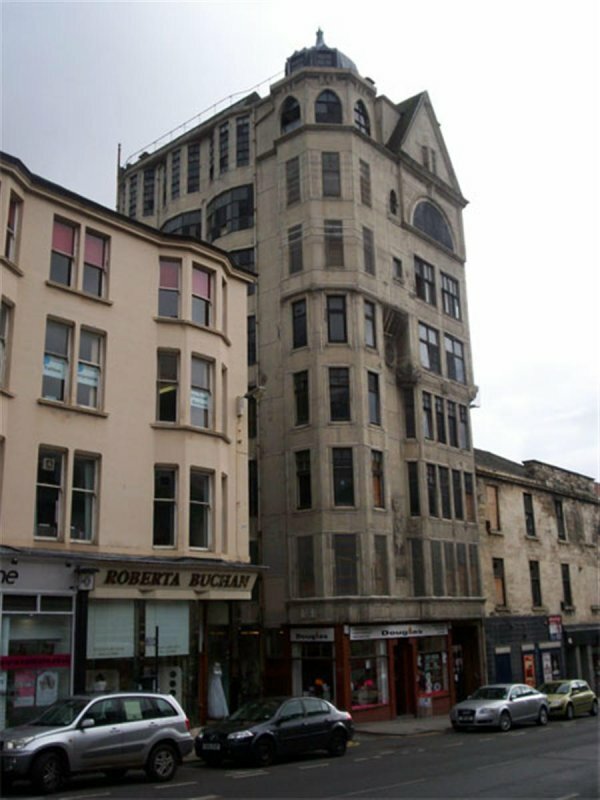 29 January 2004: The Evening Times reports that the building remains in multiple ownership, though it will pass to Glasgow City Council if a developer emerges to renovate the building. Scaffolding is now being dismantled. 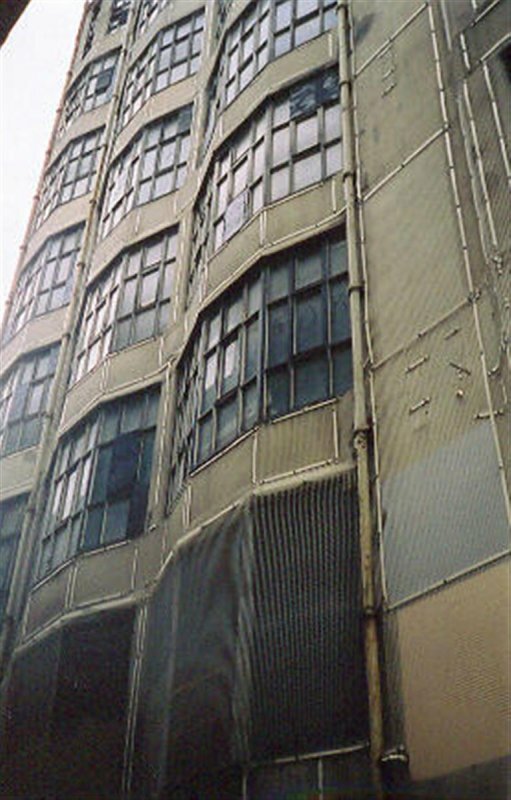 June 2004: External inspection reveals that the scaffolding has been taken down, though the wire mesh remains. November 2004: Local planners report that the property is now available, though not for lease. 16 April 2005: The Herald carries a piece on the building and its architect. 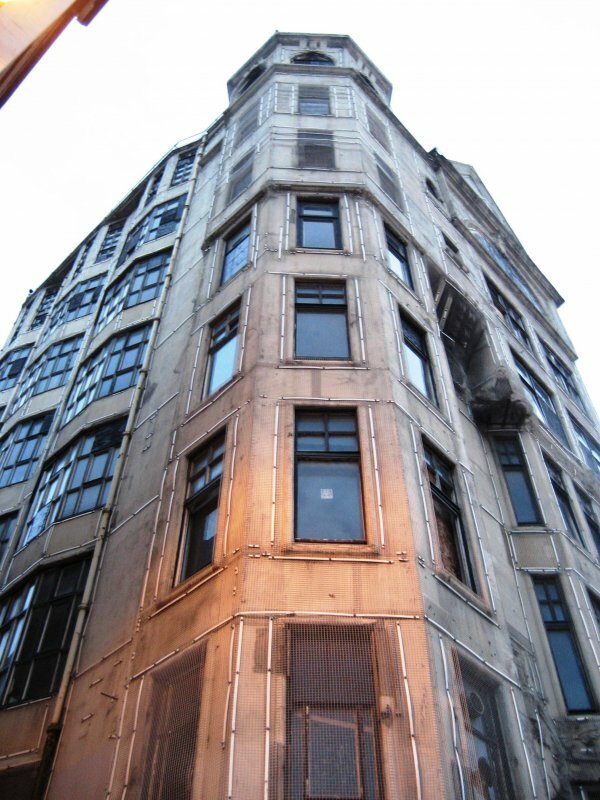 December 2006: GBPT report that they are no longer involved with the building. September 2007: External inspection shows that the wire mesh remains in place. The ground floor is now in use as an office supplies shop. 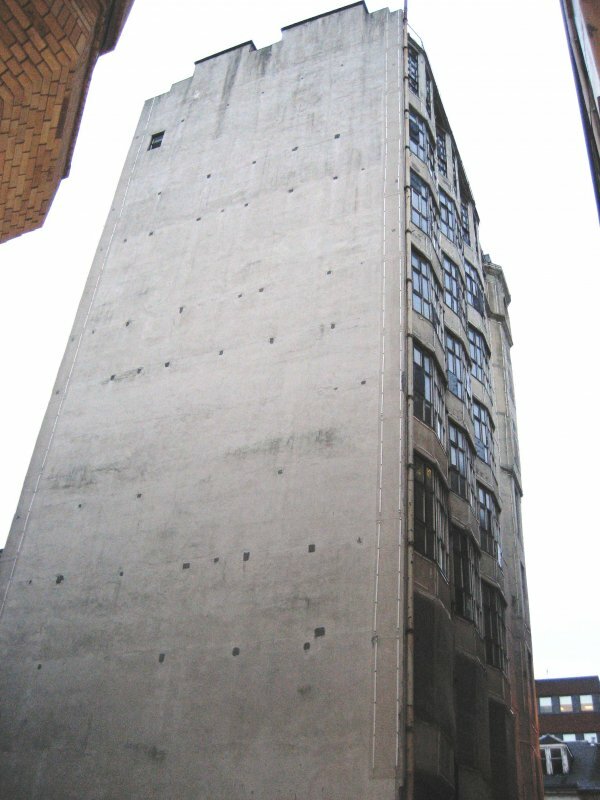 Approximately 25% of the windows are boarded over, others are open to the elements. North and east walls are heavily graffitied at ground level. 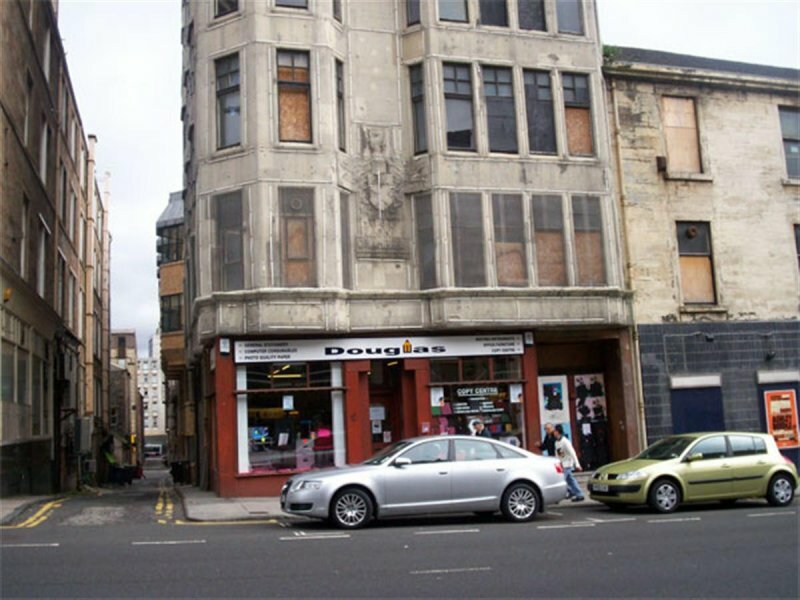 January 2010: The Glasgow Evening Times reports that the last business unit in Lion Chambers is shortly to close, leaving the building empty. 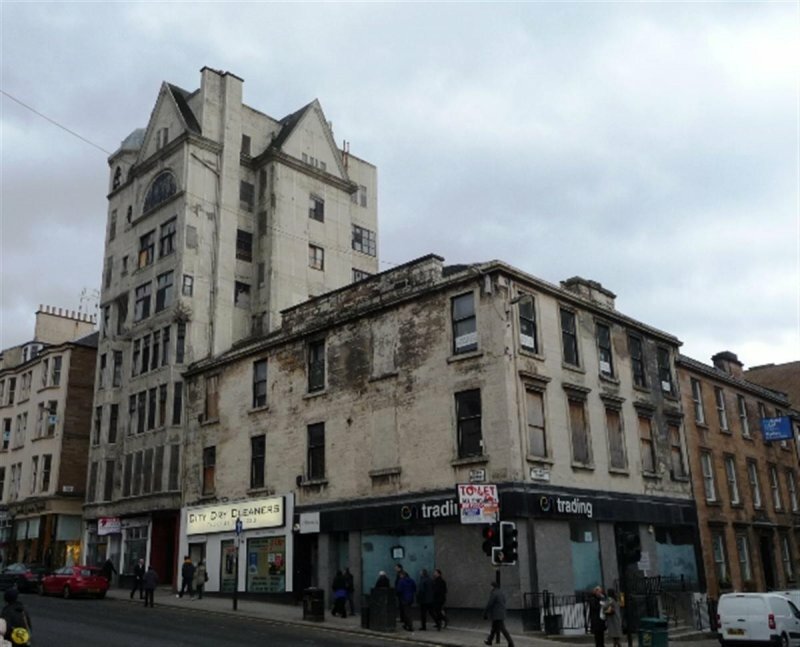 The article goes on to note the poor condition of the building, which Glasgow City Council offered to purchase from the multiple owners for £1, to enable restoration, but the deal fell through. 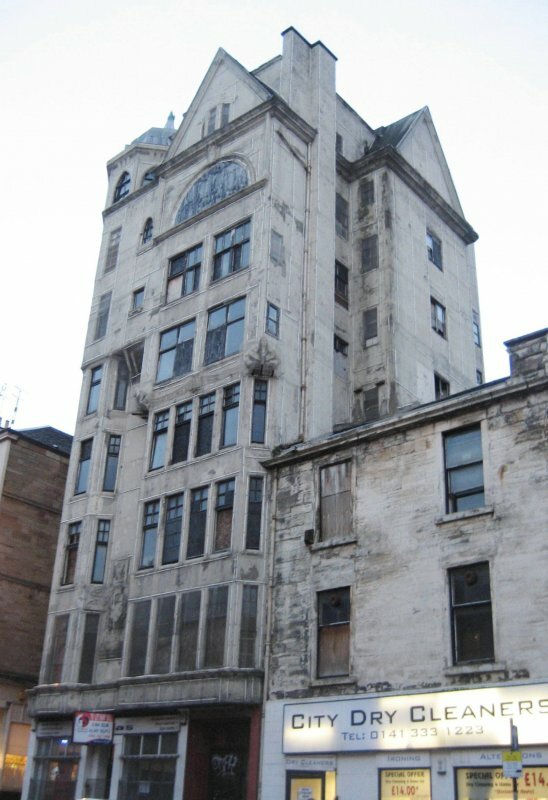 Historic Scotland and Glasgow City Council are committed to finding a solution to save the building. 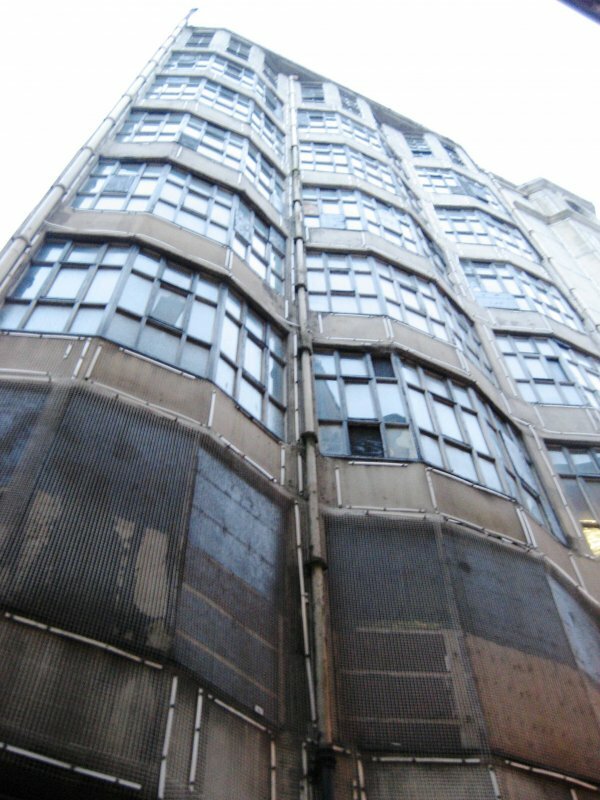 November 2010: External inspection finds the building remains derelict. Outwardly, it appears to be in similar condition to our previous visit. The shop unit on the ground floor is confirmed to have closed. October 2011: The Four Acres Charitable Trust is currently working on an options appraisal for the conservation and reuse of the building. 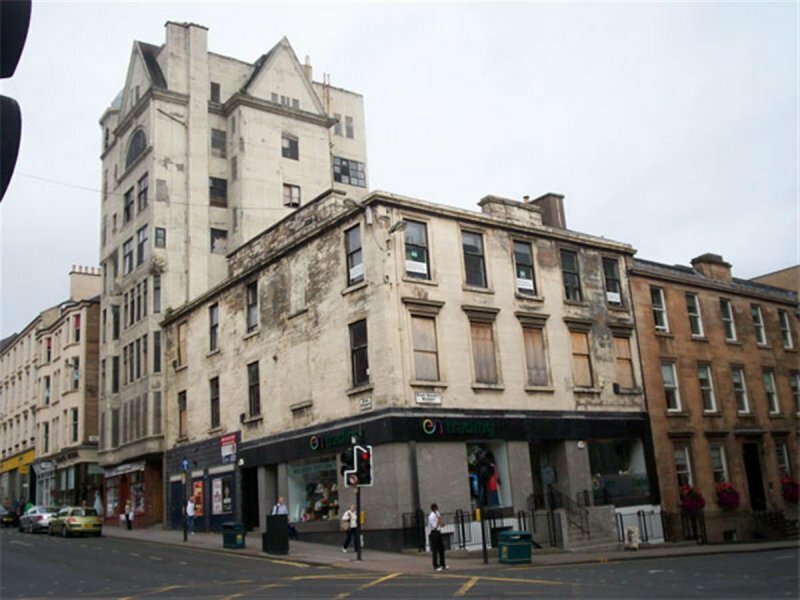 14 December 2013: External inspection finds the building disused with the ground floor retail unit being marketed for sale/ let. The building remains in much the same condition as last seen - covered in steel mesh and secured.